Halloween is nearly upon us and I feel like I haven’t yet gotten my yearly fill of creepy decorations and festivities. Granted, we’ve been to a haunted corn maze, had our 3rd annual Halloween movie marathon, I even baked a pumpkin. Not to mention, we’ve watched over 40 horror movies this month (so far). It’s still not enough though. So tonight, just to satisfy my Halloween cravings, I made this spiderweb cake. I think it’s creepy but still has a bit of elegance. No one wants to eat a cake that looks gross, even if it’s supposed to evoke grossness. 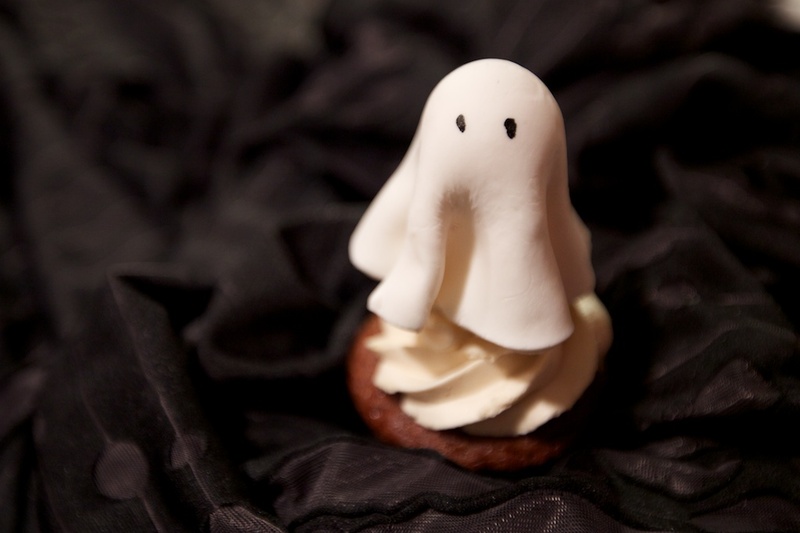 I had a little extra fondant (and a leftover cupcake) and this little ghost came haunting around. Before this weekend arrives, I still hope we’ll get to carve pumpkins. I’ve got my costume all together and can’t wait for all Halloween festivities. Looking for more Halloween inspiration? Here are some more Halloween desserts from years past. i honestly love your halloween deserts, they are all so crazy looking! thanks for sharing. so i am dying to know…whatcha gonna be for halloween? Totally adorable! And I think you definitely managed to keep a bit of elegance… it’s not at all gross or off-putting. Ooh, the cake and cupcake are spooky cool! What a gorgeous Halloween treat! Love this. Are you still going to do our wedding cake/cuppy-cakes? sure thing lady! let’s chat. 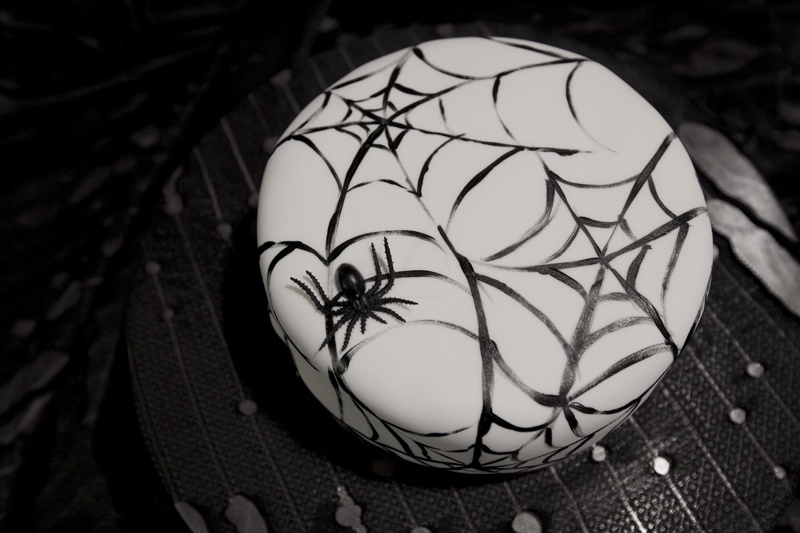 Wait a minute… I linked over from foodgawker because I thought the spider web cake was adorable, but then I saw the ghost. Too cute!!!!!!!! gorgeous cake, especially as you can see that it was done by hand and with love. way to go! Oh my gosh I love looking at all your Halloween treats. It makes me so happy. Having to work through all the Halloween fun it’s nice to come check out all your cute and delicious Halloween stuff. This cake is stunning! Totally impressive, and I bet it tasted so good! 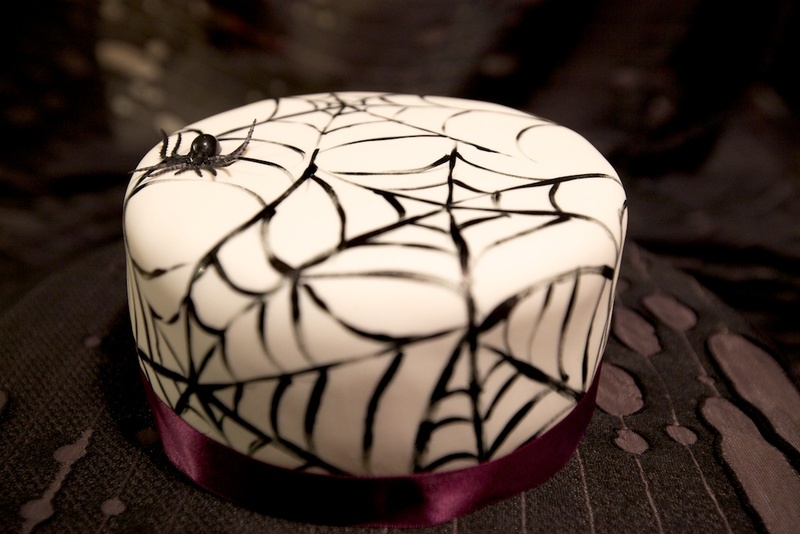 I have an event coming up and have been looking at spider web cakes. This is the best I’ve seen so far! WOW! How on earth did you get it to look like that? That’s quite impressive.